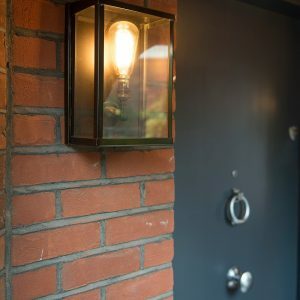 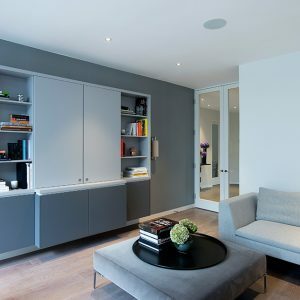 The owners of this recently renovated 5-bedroom house in Maida Vale were keen for their home to reflect their personal style. 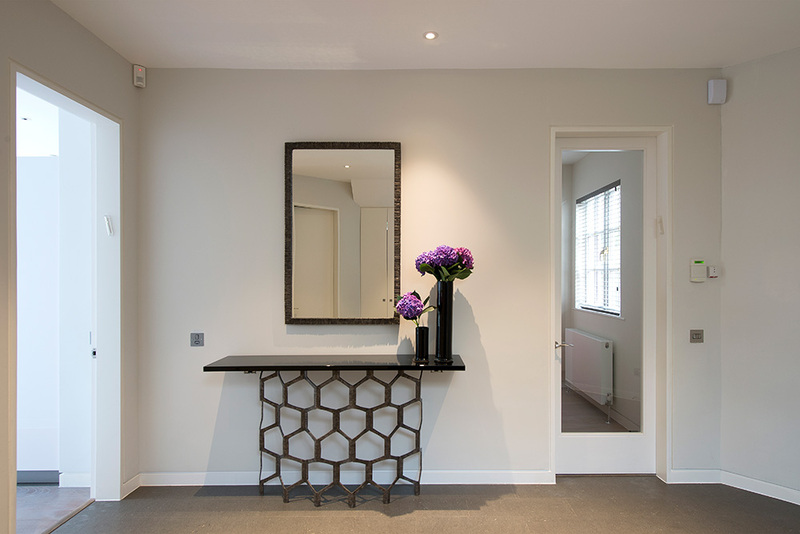 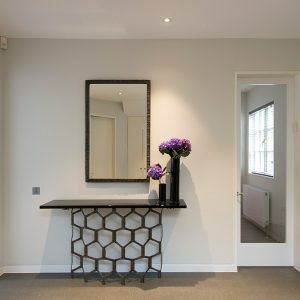 With both clients being well-travelled and a good eye for design, we wanted to surround them with unique and sourced pieces that would complement their existing furniture. 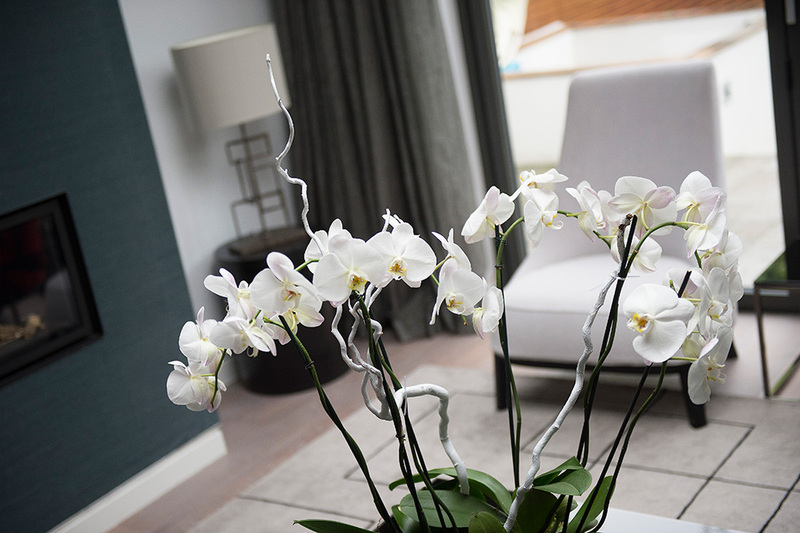 We created a contemporary look with a very neutral colour palette of predominantly grey with an abundance of luxurious metals, textures and natural materials. 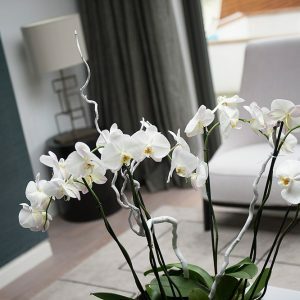 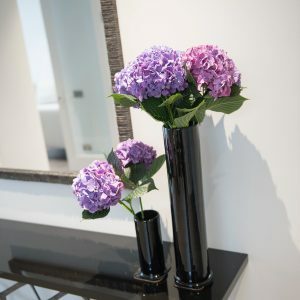 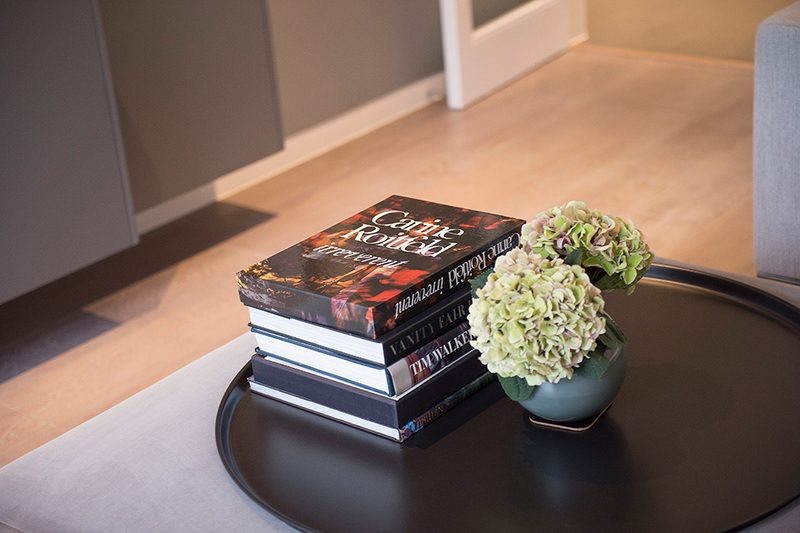 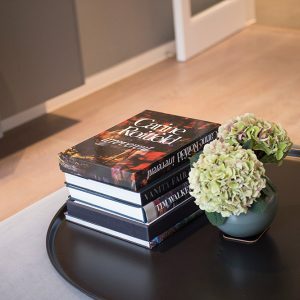 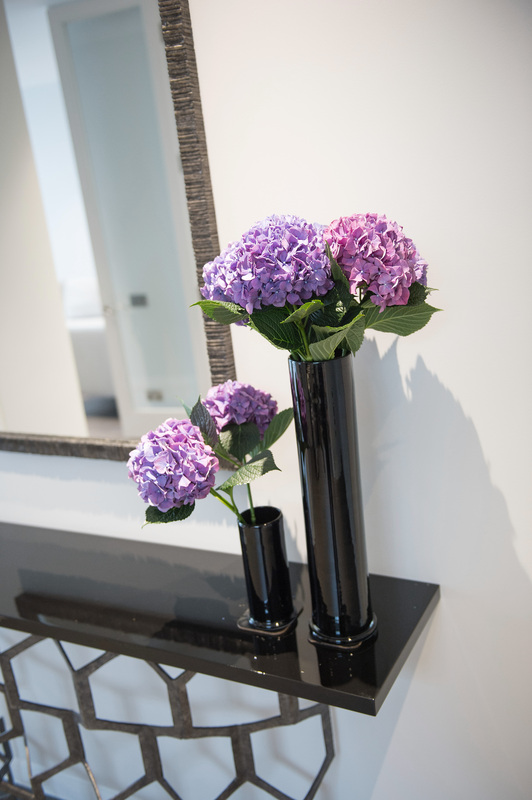 We furnished the property throughout with bespoke furniture, rugs and carefully sourced accessories and soft furnishings. 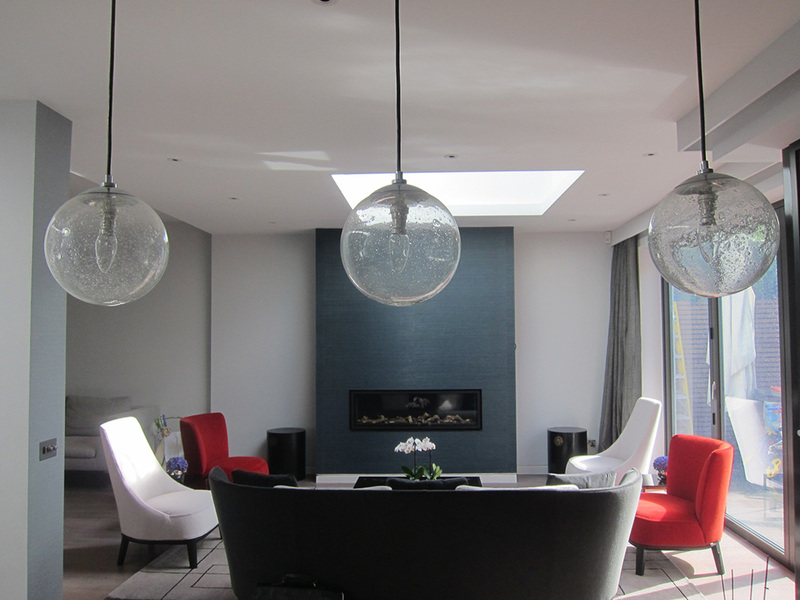 statement lighting in the entrance hall, family room and master bedroom. 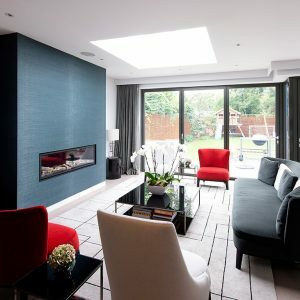 Designing for a small family we focused on zoning the space and creating an additional sitting area in the family room to make the space work for the whole family. 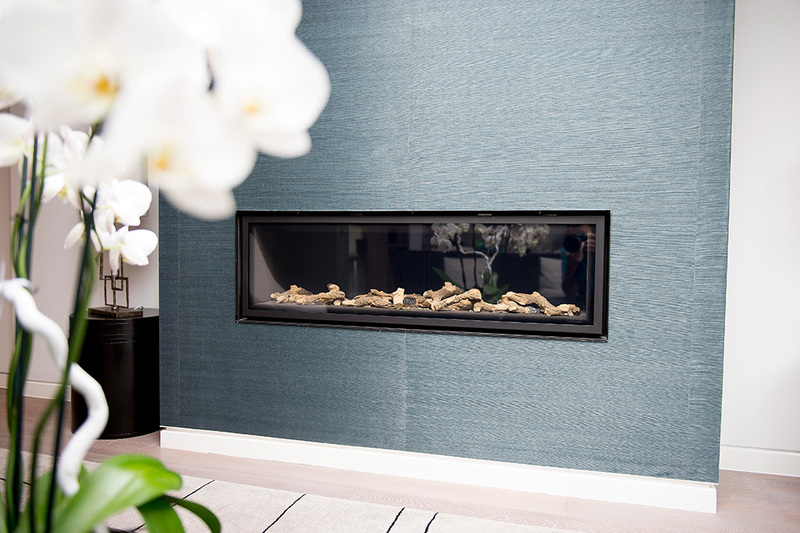 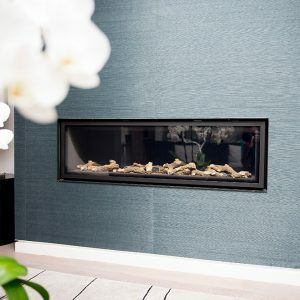 We designed and installed a fireplace to clearly define the new zone, cladding the wall in a stunning seagrass wallpaper to give a luxurious feel and created balanced with stunning Porta Romana table lamps sat proudly on antique hat boxes either side of the fireplace. 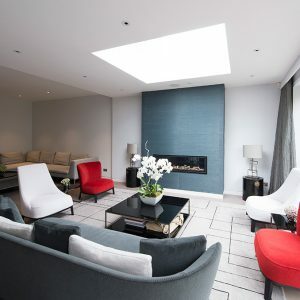 The introduction of a bespoke statement graphic rug from the Rug company in a generous size gives a feeling of space and clearly zones the new sitting area. 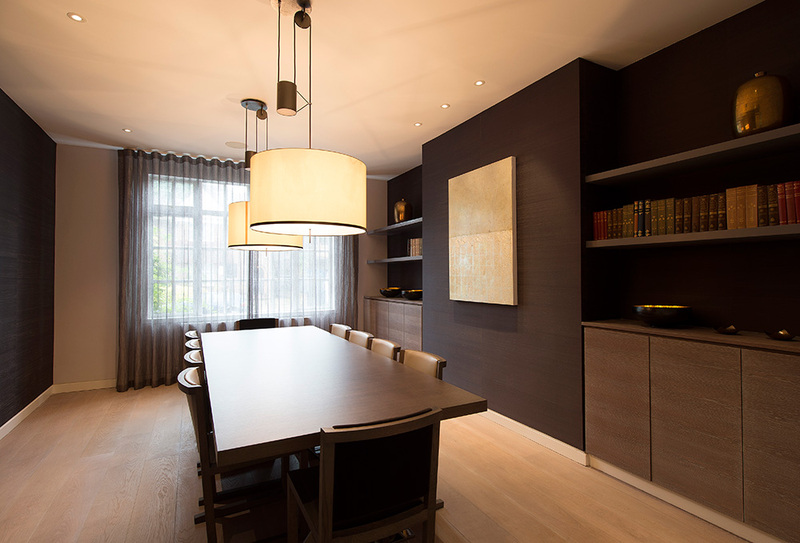 Making a connection between the kitchen, casual dining area and lounge was essential to define. 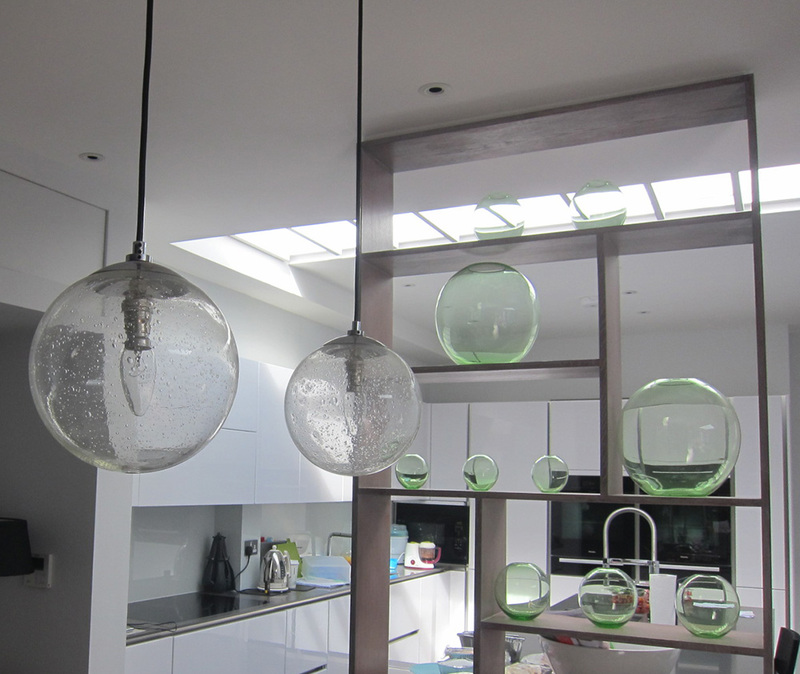 We achieved this by creating a simple divide with hand blown glass pendants hung low over the dining table creating a transparent wall. 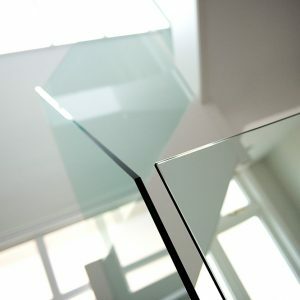 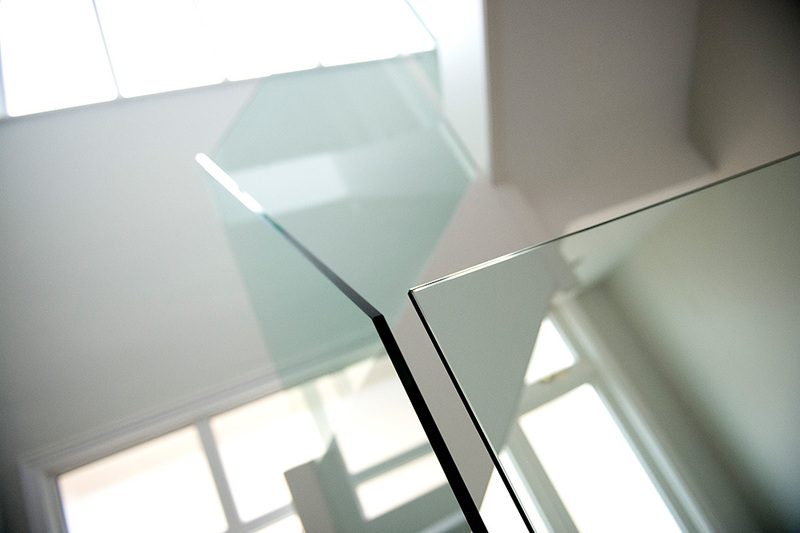 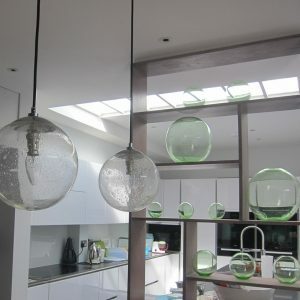 Glass accents were threaded through the kitchen dividing wall to continue the theme. 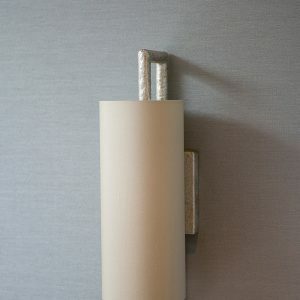 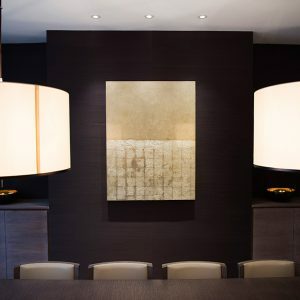 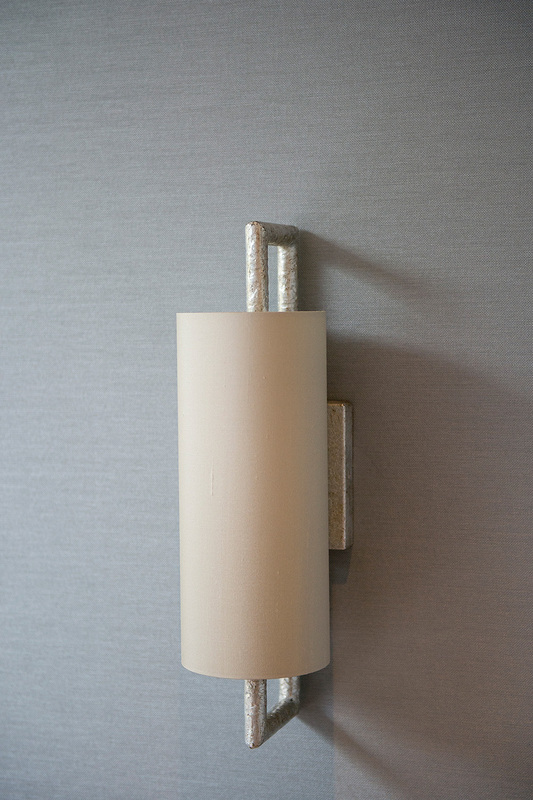 statement artwork from Claire Burke, fashioned from gold and silver leaf enriches the interior making the space glow. 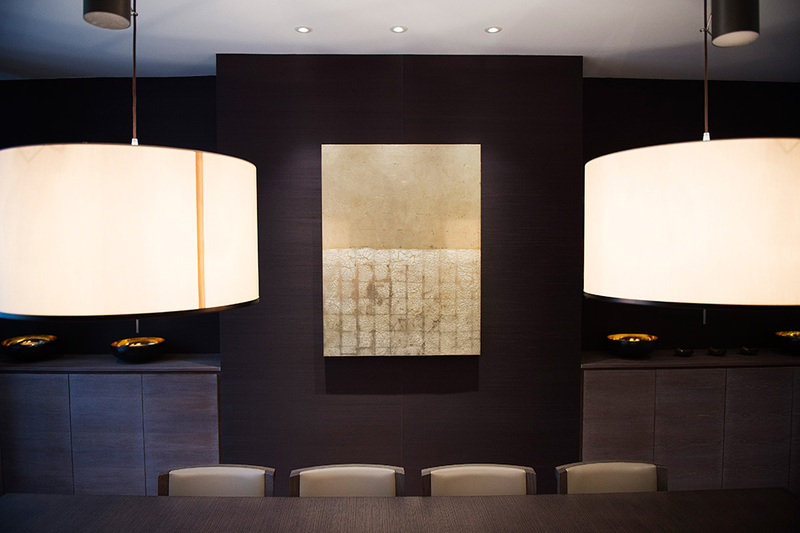 We worked closely with Katherine Maginnis a contemporary arts agent to source artwork for the home that was perfect for each space. 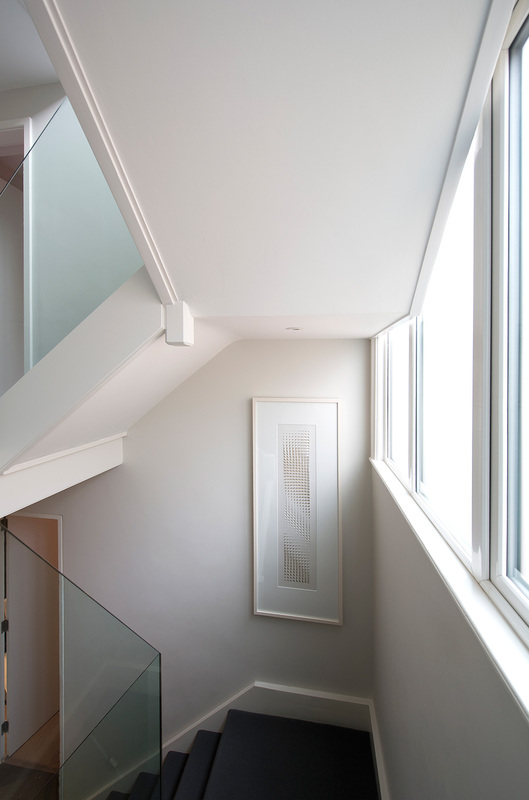 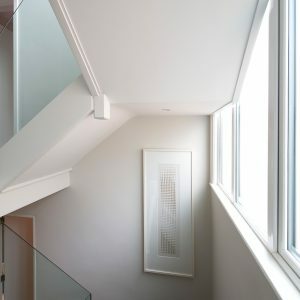 We loved the architectural feel and clean lines of Toni Davey’s cut paper artwork which we hung on the staircase leading you to the first floor. 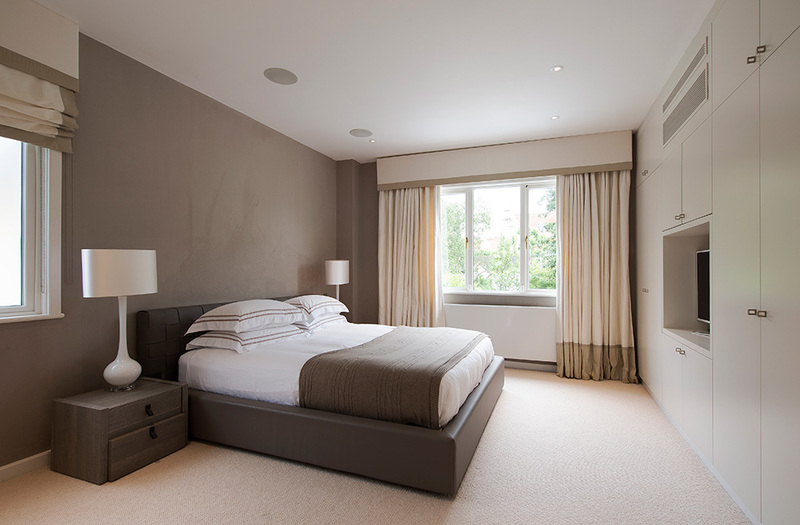 The master bedroom was crying out for softness and a touch of sophistication. 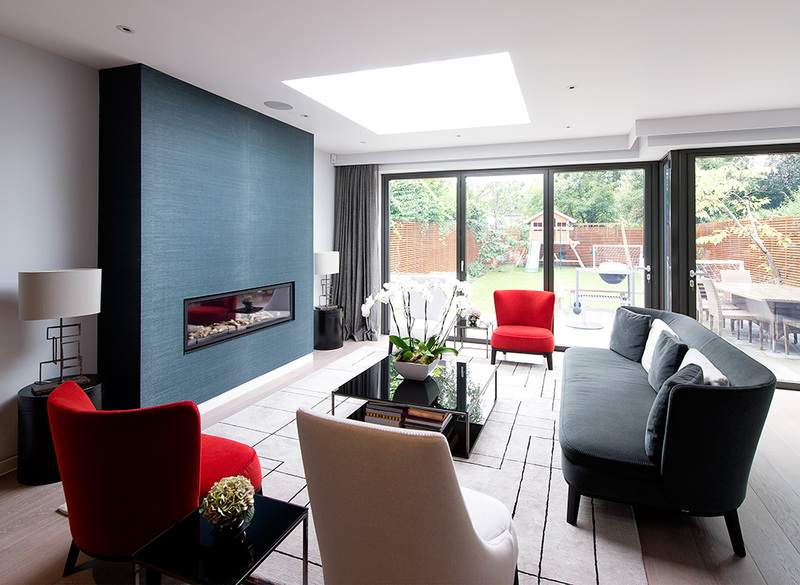 Full-length silk curtains framed the windows perfectly and the deep border adds a contemporary look. 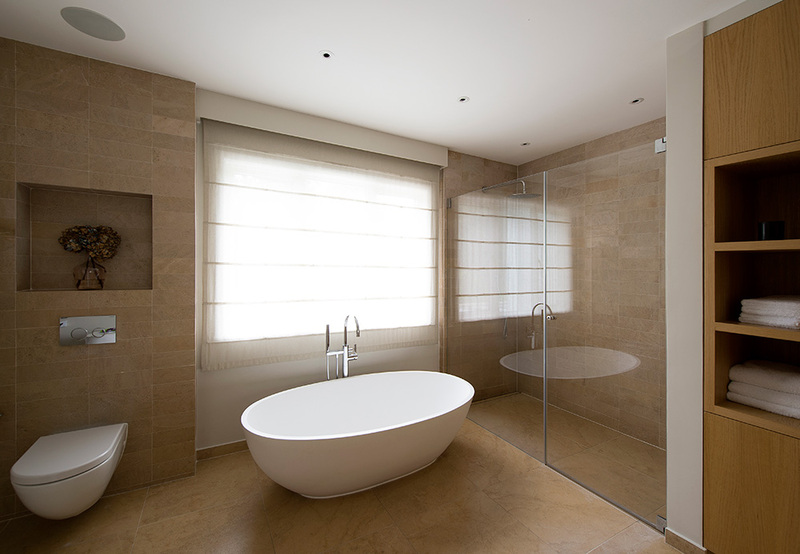 The rooms are clad in suede giving a subtle depth and movement to the walls. 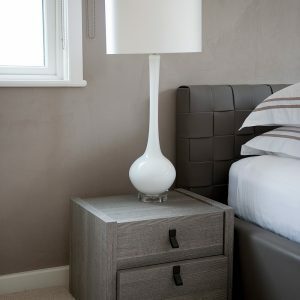 The leather woven bed grounds the room and adds a modern twist to the interior. 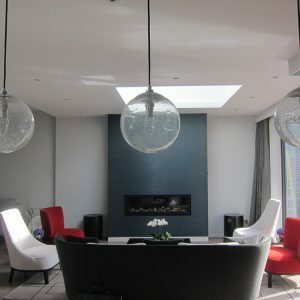 It was important to add statement lighting in this space as the only lighting was downlights overhead which can be harsh at night. 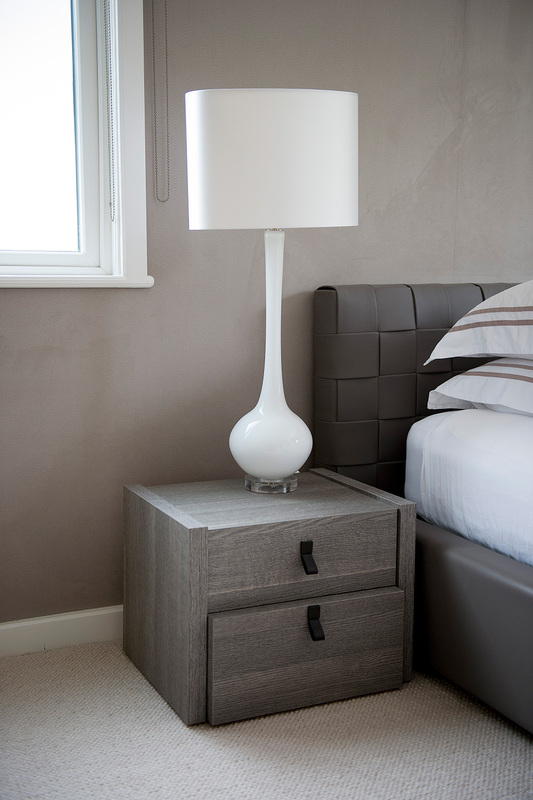 The opal glass tables either side of the bed give off a warm glow in the evenings. 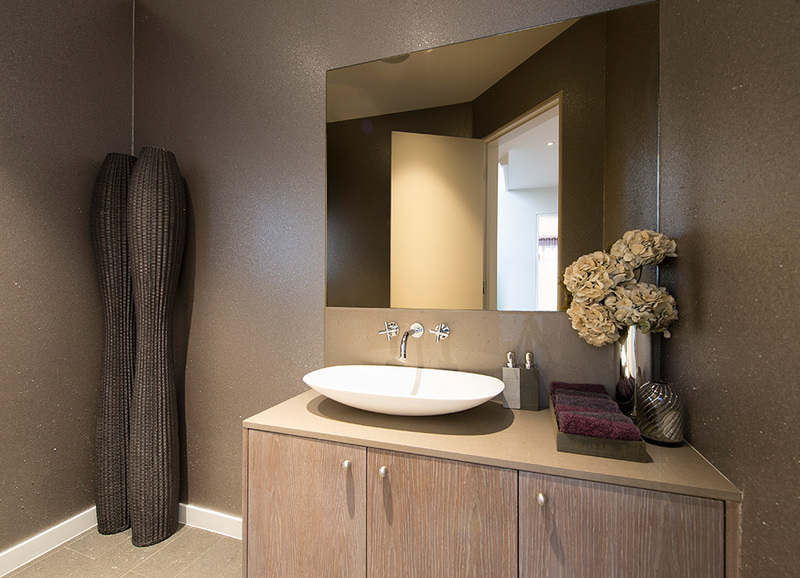 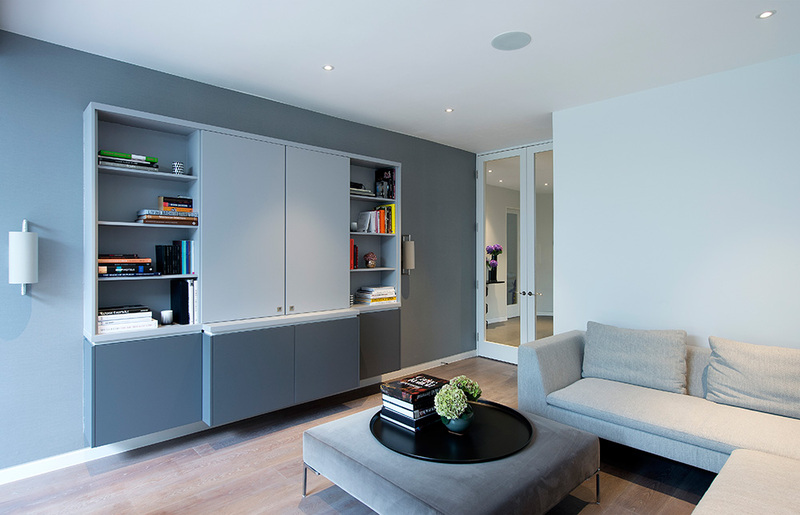 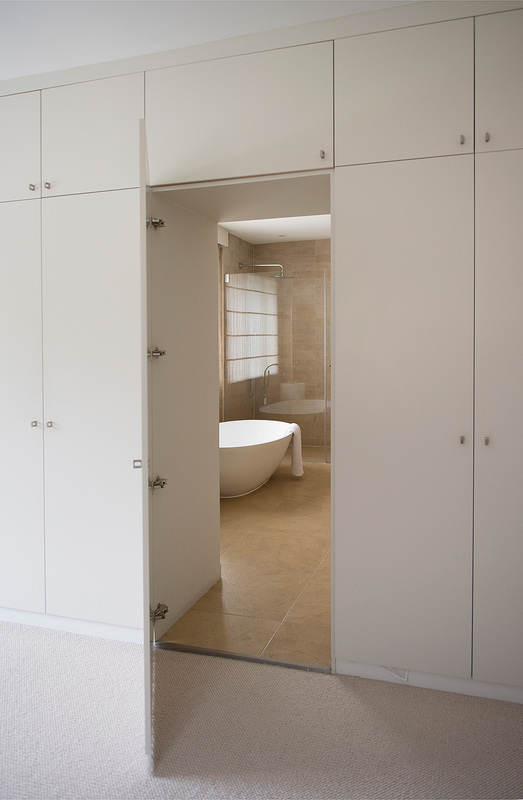 Storage was carefully thought out by the architect and included a secret door into the master en-suite where we dressed the space with modern accessories and added tonal sheer blinds to allow the light to filter into the space. 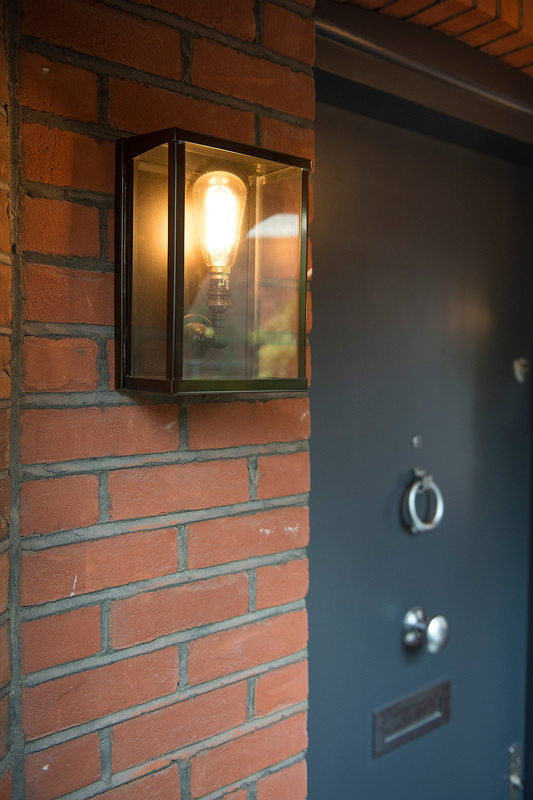 We designed the interior of this Maida vale home to grow with this lovely family allowing them to inject personal touches and treasures from their travels. 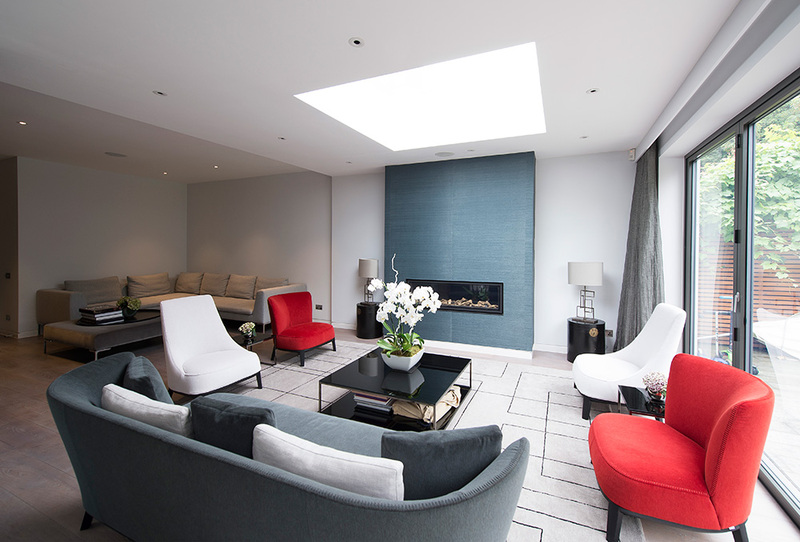 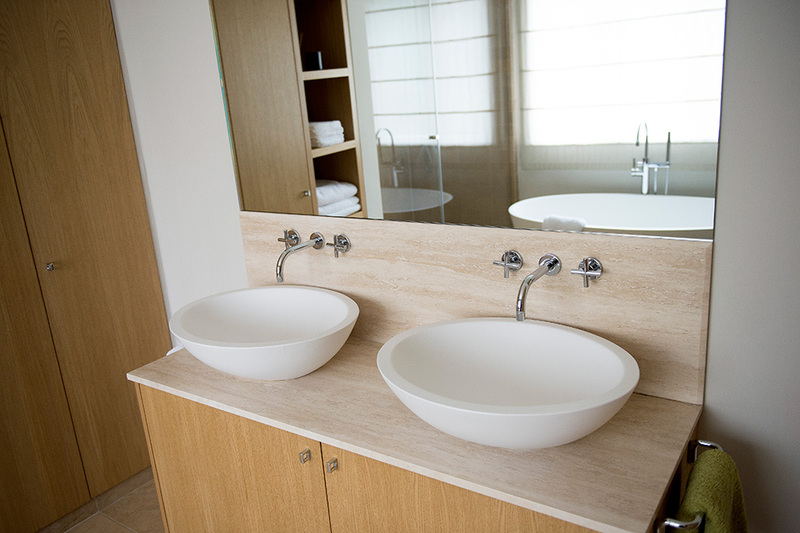 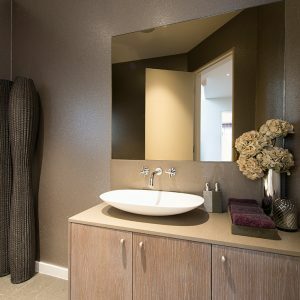 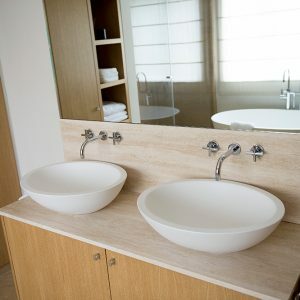 The result is a calming and luxurious space with dedicated areas for everyone in the family.